We're in full swing of the 1st birthday party over at The Craft's Meow on day 4! 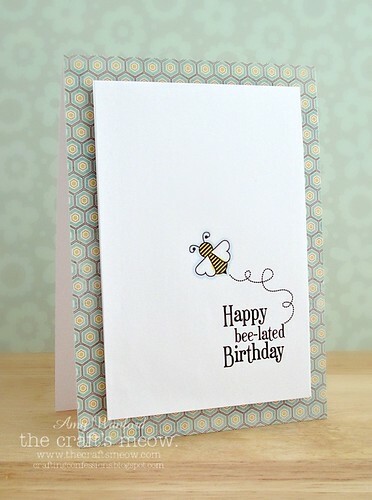 My card celebrates a belated (or should that 'bee' 'bee-lated') birthday - hee! This gorgeous set(Thanks Bee to Thee) will be a free gift to customers who spend $50 or more at the TCM Store from March 21st to March 31st! Wanna know another way you could try and grab this gorgeous set for free? That's right, leave a comment on the TCM Blog by 9pm PDT tonight and one random commenter will win this set for their own inky mitts! Now earlier I mentioned an awesome prize for partying with us today. Simply create a project with a celebratory theme that uses at least on TCM stamp or digi image (grab your free digi images on the TCM FB Page or if you're not on FB pop an email to thecraftsmeow@gmail.com) and one randomly selected player will win a Guest DT Position on The Craft's Meow! Yup - if you play along with us you could be guest designing with us in the future! You've got until March 31st to play along with this challenge and any other challenges for this party! Full deets on the TCM Blog. Thanks for being a fabulous guest at a this party! We're ready to wrap this party up tomorrow with a fabulous blog hop and of course, the official release of all the sets we've been peeking at these last few days for you to purchase! Yay! What an adorable card, Amy. Hey Teamie, way to rock the bee-u-tiful stamps...perfect choice of MME paper...love it. Great CAS card, and that base paper is just too perfect for this stamp set! Very cute! Love the CAS-ness of this design! Great choice of DP, and beautifully colored image. Can't wait to see this whole set! Beautiful card Amy. Yes, that paper is PERFECT for the honeycomb look. 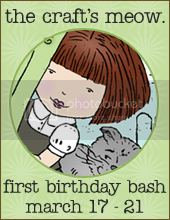 Another Amy on the blog hop and another cute card! Wonderful card and the paper is perfect. beautiful and adorable. Perfect paper for the little bee. Love how you outlined the bee with marker. Lovely CAS card! That DP matches your bee so perfectly! Oh so love the simplicity of this set & the white space. Love love! what a cute card. you're right - that patterned paper is perfect! Sigh. This is just perfection. Perfection! Love the patterned paper...it compliments the fun set perfectly! simple and cute...thanks for sharing. You are rocking the CAS with these sets Aimes! So love your take! Loving the background paper. Teamie, thank you for the inspiration and ideas. ok, where to start: I think the patterned paper is perfect for the little bee. The coloring is perfect with the blue outline. The sentiment and all the white space is perfect for this CAS card! Party on with The Craft's Meow - Day 3!